Including a chapel at Shipston on Stour & a chapel at Tidmington, each of which was a separate Civil Parish in 1719. The two were ecclesiastically severed & united at the same time to create Shipston on Stour Ecclesiastical Parish. Transferred in 1931 from Worcestershire to Warwickshire. Tredington: Compotus roll 1524; Manor books 1781-1860; Rental 1695-1702, 1759-1805; Surveys and particulars of property 17th-19th cents. ; Surveys, valuations, manor books, rent rolls etc. 17th-19th cents. TREDINGTON, a parish forming, with the parishes of Shipston upon Stour, and Tidmington, a distinct portion of the upper division of the hundred of OSWALDSLOW, county of WORCESTER, being locally in the Kington division of the hundred of KLNGTON, county of WARWICK, 2¼ miles (N.) from Shipston upon Stour, containing, with the hamlets of Armscott, BlackwelL, Darlingscott, and Newbold, 1032 inhabitants. The living is a rectory, in two portions, in the peculiar jurisdiction of the Rector, jointly rated in the king's books at £99.17.6 and in the patronage of the Principal and Fellows of Jesus' College, Oxford. The church is dedicated to St. Gregory. 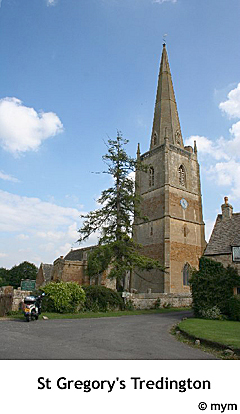 This parish was divided, under an act passed in the 6th of George I., when the townships of Shipston and Tidmington were separated from it, and constituted a distinct parish. The river Stour runs through the parish. Here was formerly a monastery, the remaining part of which is now the rectory house. There is a small endowed school in the parish.